Tempeh Bacon that is. 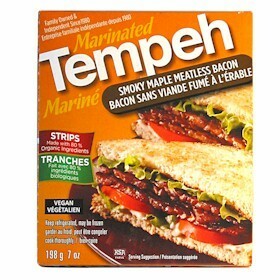 Today I discovered the delicious taste of maple flavoured tempeh, what is tempeh you ask, tempeh is a cooked slightly fermented soybean that’s formed into a patty, similar to a very firm veggie burger. Although tempeh is made from soy, it has a unique taste and is mildly flavorful on it’s own, unlike tofu. If you aren’t fond of tofu, tempeh is also very high in protein and calcium, as well as beneficial isoflavones, but tastes nothing like tofu. Tempeh has a textured and nutty flavor. Although tempeh may be new to the west, tempeh has been eaten in Asia for hundreds of years. I purchased the maple flavored tempeh from Choices Market, the picture on the box sold me. I was grilling it up and it smelled a whole lot like bacon! I toasted my bread, pan grilled my tempeh, sliced my cucumber and tomato, broke off a few pieces of spinach and topped it off with a bit of salt and pepper to finish the job. Perfection! I can’t remember what bacon tastes like it’s been so long. I’m going to say this did a pretty good job in flavor and for those of you looking for a replacement while you are transitioning or for those of you wanting to just cut back I think you might be surprised, It was really good in my opinion. Remember when you are making changes or are just trying to cut back, you are not going to find identical replacements for foods, you can however find the taste for the most part. You have to get used to the new tastes and textures. Also your piece of chicken or steak is not good on it’s own, it’s the sauce you put on it that gives it taste, it’s the same with everything else too. Guaranteed not to clog any arteries give you heart disease or promote high cholesterol or cancer. I’ll be buying this maple flavored tempeh again. Most definitely delicious. Quality write, I will be checking back persistently to watch out for posts.